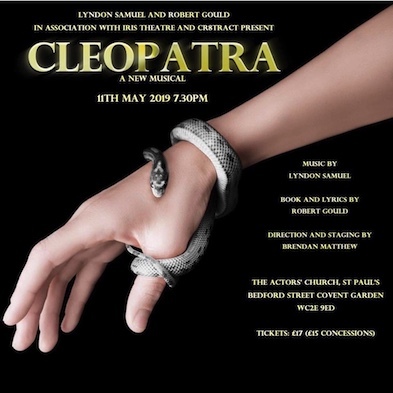 A concert version of the new musical Cleopatra (written by two Welsh creatives) will be staged at the Actors' Church in Covent Garden, London on Saturday May 11 as part of Iris Theatre Company's WorkIn Progress season, co-produced by Cr8tract productions. Epic in scale and intimate in its emotional intensity and with a soaring and lavish score, Cleopatra The Musical focuses on the character of the infamous Queen of ancient Egypt and the conflict between her desire for power and her need to be loved as well as on the dramatic political and war-torn background of the times and the tragedy of the two men (Julius Caesar and Mark Antony) who were doomed by their love for her. The show's composer, Swansea born Lyndon Samuel, has over 20 years experience as a musical director for musical theatre and in 2010 he produced, directed and musically directed Andrew Lloyd Webber's Tell Me On A Sunday at the Swansea Grand Theatre. He composed music for Ghost Story to a libretto by Joseph Taylor and his electronic space-themed album Nebula was released in January 2019. The Book and Lyrics for Cleopatra were written by Robert Gould, the librettist/lyricist of the 2018 Offie Award finalist for Best New Musical, My Land's Shore (set during the infamous Merthyr Rising of 1831), which received its world premiere production at Ye Olde Rose And Crown Theatre in London in 2017 and its Welsh professional premiere at Theatr Soar in Merthyr in 2018. His other musical theatre credits include the Book and Lyrics for A Pebble For Aaron, which was a finalist for the MTI Stiles And Drewe Mentorship Award in 2016, and Grace Notes, a finalist in the Leicester Square Theatre New Musicals Project in 2014. An album of Gould's lyrics, Words Shared With Friends, was nominated for a Broadwayworld Album Award in 2014 as Best Compilation Album. The cast for Cleopatra In Concert will be led by Lily De La Haye (My Land's Shore, Cats, Imagine This, Parade) as Cleopatra, Rhys Benjamin (Suessical, The Fix) as Mark Antony, Kit Esurouso (Tina, Tiger Bay, Showboat) as Julius Caesar, Gareth Evans (Tuck, Loserville, BBC's Pitch Battle) as Octavian and Cassiopeia Berkeley- Agyepong (Caroline Or Change, Haymarket, Son Of A Preacher Man) as Calpurnia. They will be joined by an ensemble who will include Tom Blackmore (Grindr The Opera, My Land's Shore, Metropolis), Luke Byrne (White Christmas, La Cage Aux Folles, Soho Cinders), Harry Downes (Thrill Me), Ceris Hine (Around The World In 80 Days, My Land's Shore, The Rocky Horror Show), Kate Hume (The Snow Queen, Chicken Little, The Kissing Dance) and newcomer Dylan Ross. Cleopatra In Concert will be directed by Brendan Matthew, whose directing credits include The Hired Man (Union Theatre), My Land's Shore (Ye Olde Rose And Crown Theatre and Theatre Soar) and The Kissing Dance (Ye Olde Rose And Crown Theatre). As a performer, he recently played the title role in the new musical Guy (at The Bunker and on tour). The concert will be musically directed by Lyndon Samuel.